Twenty-four teams gathered in Portland, Oregon to fight for eight bids and move on to the Opening Round Championship Site in Irvine, California. The UW’s inaugural team earned one of the slots with a 6-2 record. 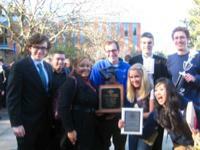 The program also won a perfect 30/30 score for the “Spirit of AMTA” award, which recognized the team that best exhibited the principles of fair play and civility inside and outside the courtroom. Camden Swita received 20/20 ranks as a witness for his portrayal of an ethics professor. Mr. Swita was the only witness to receive perfect ranks in the entire tournament. Nick Crown received 18/20 ranks as a plaintiff attorney.